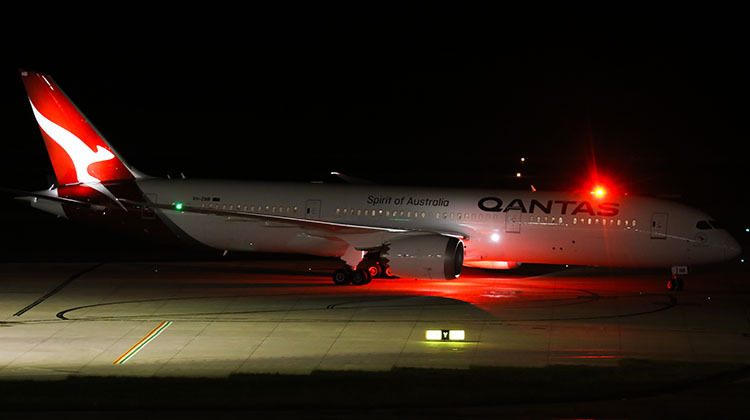 The second Qantas Boeing 787-9 Dreamliner has completed its delivery flight, touching down at Melbourne Airport late on Sunday evening. The aircraft, registered VH-ZNB, departed Paine Field, Everett at 3:24pm local time on Saturday, touching down 15 hours and 24 minutes later at Melbourne at 10:46pm Sunday (after crossing the International Dateline midday through its journey), flight tracking website Flightradar 24 shows. VH-ZNB had completed its first flight on November 30. It joins in the Qantas fleet 787-9 VH-ZNA, which arrived in Sydney at the end of its delivery flight on October 20. The delivery of the airline’s second 787 will allow Qantas to begin international flights with the type between Melbourne and Los Angeles later this month. Since November 1 Qantas has been operating VH-ZNA on domestic services, allowing its crews to gain experience in operating the type. With the delivery of its third and fourth 787s Qantas will then begin Melbourne-Perth-London flights from March 2018. We have previously been advised that ZNC will be delivered to Qantas on the 31st of December. Does anyone know when it is scheduled to arrive in Australia? I think the new livery is displayed best on the 787, I think it looks great buts thats me. The Melbourne – Los Angeles QF95/96 service starts this Friday (15 December). Why dont the 787’s have the red kangaroo on the engine nacelles like the 737’s? @ John, apparently the 787 nacelles cannot be painted….? Dunno if this is true. I believe the reason is actually because the engines will be pooled with the JQ 787-8s who’s engines are also white so it saves having to apply and remove the kangaroo every time an engine goes in forcmaintenae or comes back. The engines aren’t that different to the A380 and those will have a kangaroo on them. It makes sense, airlines like CX and BA who pool engines has seen over the years after engine changes, QF aircraft operating with a BA or CX cowling and vice versa. Painting the nacelles is still fine – for example Virgin Atlantic has them painted a deep red, BA has them in navy, etc. I’ve read the same thing on a few chatrooms, I think it has to do with the aerodynamics and the airflow around the engine (I could be wrong). If you look at the nacelles on the 787, they really smooth compared to a 767 or 737. @ NJP.. Air Canda’s new livery, Virgin Atlantic, Avianca, Kenya Airways and BA 787’s have painted nacelles (not white? The discussion regarding the absence of the new kangaroo logo on the QANTAS B787 engine nacelles has been had before with no definitive conclusion at that time. I’m inclined to lean towards accepting the proposed concept that QANTAS and Jetstar might share/pool engines, assuming the power units are indeed identical for the Qantas Group -8 and -9 series aircraft. The suggestion that there are no kangaroo decals because it will affect the laminar airflow doesn’t seem to ring true. A quick look at current B787 liveries shows for example that, AirFrance, AirIndia, Avianca, KenyaAirways, KLM, LOT, QATAR, Tarom and Uzbekistan all have their corporate logo located on the engine nacelles. In addition many other carriers (Aeromexico, ChinaSouthern, HainanAirlines, ANA, BritishAirways, ElAl, Norwegian, RoyalBrunei, Scoot, Thai and even Boeing on their prototype B787-9) have either a GE or RR decal identifying the powerplant manufacturer affixed to the engine nacelle. If indeed there was anything more than a negligible effect to laminar flow I would be very surprised. Qantas doesn’t actually own the engines. They are leased on a power by the hour basis from GE. Those engines could end up on any 787 that has the same agreement with GE. What if they are yellow……….? I wonder if the paint was the reason for the increased maintenance issues that Air NZ are experiencing.? Never mind the fact that when the engine is changed the reversers and fan cowls stay with the aeroplane… The core engine is what is replaced, so no matter which operator the engine goes to, the colour of the cowling is irrelevant. The paint is white as it is particularly smooth, and also covers the wings for the same reason. That and being protective of the underlying composite structure by way of reflecting heat more effectively. Hi David 787-9 will be handed over to Qantas at Paine Field Everett on 22nd Jan 2018 for its departure to Australia, arriving in Melbourne on 24th January 2018. VH-ZND will follow on the 15th February 2018 and arrive in Melbourne on the 17th February 2018. The next airframe VH-ZNE in the 2nd batch of 4 will be handed over to Qantas on 7th Ju;y 2018 arriving in Brisbane (its home base) on 9th July 2018. Thank you Andrew for the info. I presume they will all do domestic flights prior to commencing PER to LHR, and BNE to LAX, JFK. Will be good to see. Look forward to hearing of the order for VH ZNI and onwards. Does anyone know the aircraft’s name, the first being Great Southern Land is this one Dreamtime? @Andrew McG, it’s now been announced: “Waltzing Matilda” (http://australianaviation.com.au/2017/12/qantas-plans-melbourne-to-san-francisco-flights-with-new-dreamliner/) . @Malki nice try, but the competition for suggesting names for the new Qantas Dreamliner fleet closed ages ago!